We already showed you that the Galaxy S7 and S7 edge have a hidden "condensed" display mode that fits more content on the screen than the regular DPI setting that the phones ship with. Later on it became clear that this is actually a feature of the new TouchWiz on Marshmallow, so if your Galaxy S6 or S6 edge have gotten upgraded to Android 6.0, you can access the Condensed mode there as well. Galaxy Note 5 and Edge+ ship with the scaled-down content mode by default already, on account of their larger displays. 3. Change the default regime to "condensed", and watch your Galaxy S7 fit more content on one screen than before. There you have it, and if your eyesight is not be very pleased it has to squint more now, you can always revert to the default "Standard" DPI scaling. 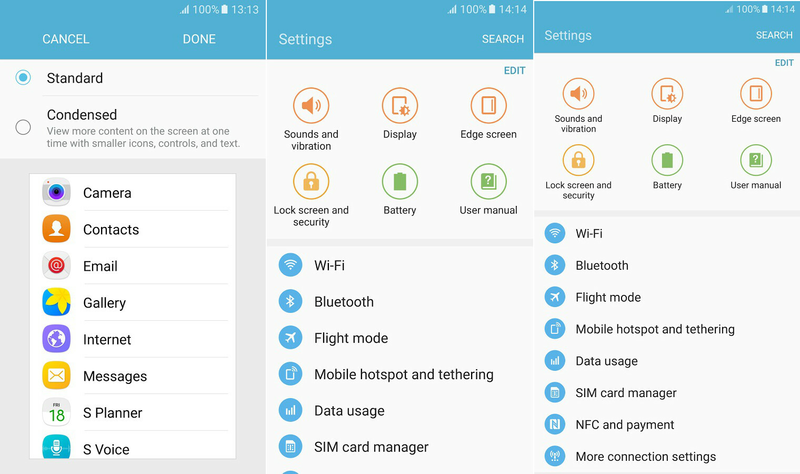 this option is not visible in Note 5, it seems to be available only on the S-line. with the Evozi's Display you can do it on note 5 as well. I did previously with the Nova's method and it worked well. Gotta try this one too. I wish there was a super-condensed level of scaling. I'd like to run it around 500 and keep Samsung Pay. Well you can do it the old fashion way of using ADB. It doesn't require root either. I don't have the command handy but Google search will bring it right up. In my finding this doesn't seem to make much difference. I am unsure if it actually changes the DPI or just condenses the UI.